In Charlotte, more than 69,000 pounds of turkey and nonperishable items were collected from more than 60 team members and their families, business partners, vendors and the general public during the two-week drive, which ran from November 1 to 15. Locally, the Thanksgiving Drive benefitted Second Harvest Food Bank of Metrolina, an organization that provides a regional distribution to charitable agencies that assist people in need. David Weekley team members delivered the collected items to Second Harvest Food Bank of Metrolina to distribute to families in time for the holiday. Second Harvest Food Bank of Metrolina (SHFBM) strives through education, advocacy, and partnerships to eliminate hunger by the solicitation and distribution of food. We provide a regional distribution warehouse and branches that supply food and grocery items to charitable agencies that assist people in need. 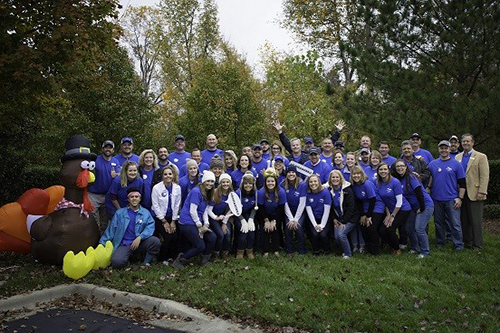 Team members from David Weekley Homes donated 69,000 pounds of frozen turkeys and nonperishable food items to Second Harvest Food Bank of Metrolina to benefit families in need.